VUJOVIC, I. , KUZMANIC, I. The potential for the usage of energy exponents in motion detection from video sequences is explored. The wavelet domain was chosen for the research due to the optimality of Hilbert's space for energy calculations and Parseval's equation for energy equivalence between domains. Five algorithms were considered: wavelet energy motion detection algorithm based on wavelet pairs and buffer, listed in the references, and four which are the contributions of this paper: modification by the application of different wavelet pairs, a modified algorithm without buffer, a modified algorithm without buffer and pairs, newly developed algorithms for energy exponents with and without buffer, but with wavelet pairs. The considered algorithms are background subtraction algorithms modified not to use pixels values, but rather energy/energy exponent backgrounds and the current situation models. These models are described by wavelet descriptors, the introduction of which is the contribution of this paper. They are compared by standard statistical criteria and execution time. The results suggest that an increase in the energy exponent decreases precision, recall and F-measure. However, the percentage of correct classifications remains almost constant. Higher exponentials reduce noise, but are more susceptible to shadows, the waving tree effect and similar abnormalities. Algorithms without buffers are less robust to illumination changes. Q. Xie, Q. Long, S. Mita, C. Guo, A. Jiang, "Image Fusion Based on Multi-objective Optimization," International Journal of Wavelets, Multiresolution and Information, vol. 12, no. 2, pp. 1450017, 2014. M. Seiferta, H. S. Hock, "The Independent Detection of Motion Energy and Counterchange: Flexibility in Motion Detection," Vision Research, vol. 98, pp. 6171, 2014. G. T. Zhai, X. L. Wu, X. K. Yang, W. S. Lin, W. J. Zhang, "A Psychovisual Quality Metric in Free - Energy Principle," IEEE Transactions on Image Processing, vol. 21, no. 1, pp. 41-52, 2012. D. Y. Huang, T. W. Lin, W. C. Hu, C. H. Cheng, "Gait Recognition Based on Gabor Wavelets and Modified Gait Energy Image for Human Identification," Journal of Electronic Imaging, vol. 22, no. 4, pp. 043039, 2013. D. J. Joo, "Damage detection and system identification using a wavelet energy based approach," Columbia University, PhD thesis, 2012. Q. He, "Vibration Signal Classification by Wavelet Packet Energy Flow Manifold Learning," Journal of Sound and Vibration, vol. 332, no. 7, pp. 1881-1894, 2012. Y. Yang, S. Huang, J. Gao, Z. Qian, "Multi-focus Image Fusion Using an Effective Discrete Wavelet Transform Based Algorithm," Measurement Science and Review, vol. 14, no. 2, pp. 102-108, 2014. J. A. Dobrosotskaya, A. L. Bertozzi, "Analysis of the Wavelet Ginzburg-Landau Energy in Image Applications with Edges," SIAM Journal on Imaging Sciences, vol. 6, no. 1, pp. 698729, 2013. 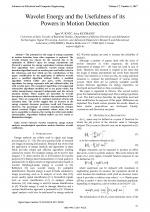 M. Vosvrda, J. Schürrer, "Wavelet Coefficients Energy Redistribution and Heisenberg Principle of Uncertainty," in Proc. Mathematical Methods in Economics, Cheb, Czech Republic, 2015, pp. 894-899. P. Sebastian, A. Pradeep, "A comparative Study of Artificial Neural Network Based Power Quality Signal Classification Systems with Wavelet Coefficients and Wavelet Based Energy Distribution," International Journal of Advanced Research in Electrical, Electronics and Instrumentation Engineering, vol. 5, no. 4, pp. 2929-2934, 2016. K. Qian, C. Janott, Z. Zhang, C. Heiser, B. Schuller, "Wavelet Features for Classification of Vote Snore Sounds," in Proc. IEEE International Conference on Acoustics, Speech and Signal Processing, Shanghai, China, 2016, pp. 221-225. P. K. Bhatia, A. Sharma, "Epilepsy Seizure Detection Using Wavelet Support Vector Machine Classifier," International Journal of Bio-Science and Bio-Technology, vol. 8, no. 2, pp. 11-22, 2016. S. Y. Elhabian, K. M. E. Sayed, S. H. Ahmed, "Moving Object Detection in Spatial Domain Using Background Removal Techniques - State-of-Art," Recent Patents on Computer Science, vol. 1, no. 1, pp. 32-54, 2008. S. Manchanda, S. Sharma, "Analysis of computer vision based techniques for motion detection," in Proc. 6th Int. Conf. on Cloud System and Big Data Engineering, Uttar Pradesh, Noida, India, 2016, pp. 445-450. S. Kumar, J. S. Yadav, "Segmentation of moving objects using background subtraction method in complex environments," Radioengineering, vol. 25, pp. 399-408, Jun. 2016. X. Hu, J. Zheng, "An improved moving object detection algorithm based on Gaussian mixture models," Open Journal of Applied Sciences, vol. 6, pp. 449-456, Jul. 2016. M. Shakeri, H. Zhang, "COROLA: A sequential solution to moving object detection using low-rank approximation," Computer Vision and Image Understanding, vol. 146, pp. 27-39, May 2016. F. Trèves, "Topological Vector Spaces, Distributions and Kernels," pp. 95-126, Academic Press, 1995. B. Hassibi, A. H. Sayed, T. Kailath, "Indefinite-Quadratic Estimation and Control: A Unified Approach to H2 and H8 Theories," pp. 81-107, Society for Industrial and Applied Mathematics, 1999. N. A. Bruisma, M. A. Steinbuch, "Fast Algorithm to Compute the H8-Norm of a Transfer Function Matrix," System & Control Letters, vol. 14, no. 4, pp. 287-293, 1990. R. Shiavi, "Introduction to Applied Statistical Signal Analysis: Guide to Biomedical and Electrical Engineering Applications," pp. 314, Academic Press, 2007. D. Rosca, "Wavelets on Two-dimensional Manifolds," pp. 8, Habilitation thesis, Technical University of Cluj-Napoca, 2012. I. Vujovic, J. soda, I. Kuzmanic, "Stabilising Illumination Variations in Motion Detection for Surveillance Applications," IET Image Processing, vol. 7, no. 7, pp. 671-678, 2013. P. Rosin, E. Ioannidis, "Evaluation of Global Image Thresholding for Change Detection," Pattern Recognition Letters, vol. 24, no. 14, pp. 2345-2356, 2003. D. K. Panda, S. Meher, "Detection of Moving Objects Using Fuzzy Color Difference Histogram Based Background Subtraction," IEEE Signal Processing Letters, vol. 23, no. 1, pp. 45-49, 2016. S. Davarpanah, F. Khaid, L. Abdullah, "BGLBP-based Image Background Extraction Method," The International Arab Journal of Information Technology, vol. 13, no. 6A, pp. 908-914, 2016. H. Zhou, G. Su, X. Jiang, "Dynamic Foreground Detection Based on Improved Codebook Model," The Imaging Science Journal, vol. 64, no. 2, pp. 107-117, 2016. W. Wang , N. Yang, Y. Zhang, F. Wang, T. Cao, P. Eklund, "A Review of Road Extraction from Remote Sensing Images," Journal of Traffic and Transportation Engineering, vol. 3, no. 3, pp. 271-282, 2016. Citations for references updated on 2019-04-22 07:20 in 163 seconds.